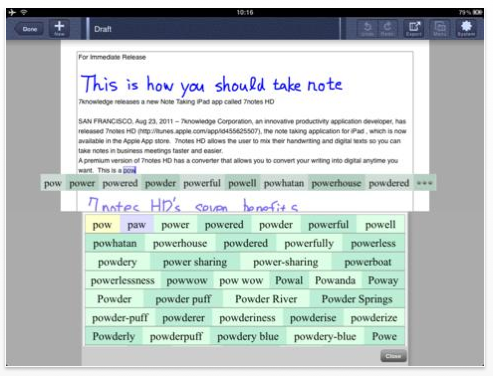 There are quite a few iOS productivity apps with handwriting recognition functionality available, for example Notes Plus, iWriteWords for kids, or (indirectly) Evernote. 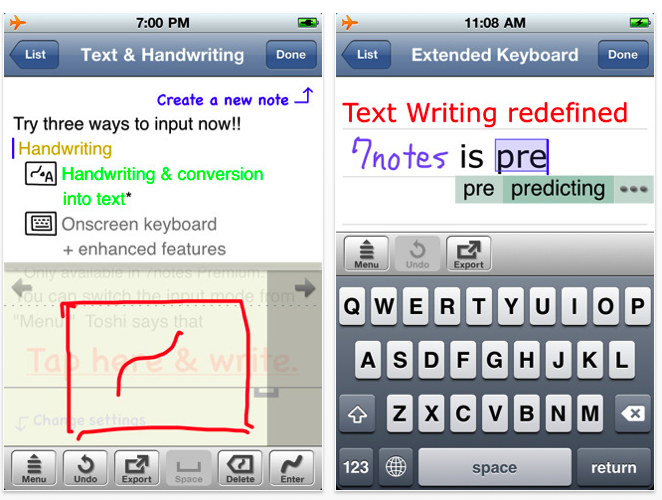 But recognizing handwritten text isn’t trivial, which is why a new app called 7notes (iPad: free, $8.99 premium/iPhone: free, $4.99 premium) focuses almost entirely on this problem – and does the job really well. The app works the same way on the iPhone and iPad (after giving both versions a spin, I’d recommend to download the iPad app if you can). 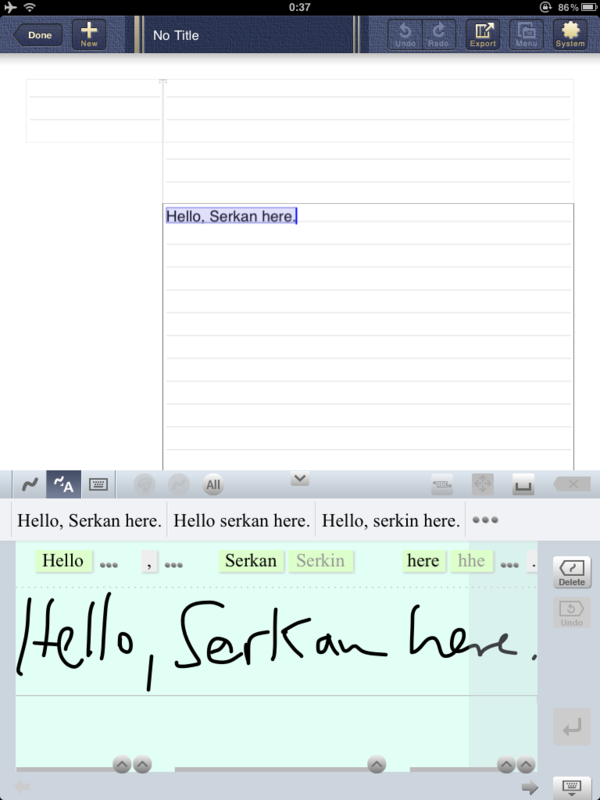 Just use your finger or a stylus pen (recommended) to jot down notes, let 7notes do its magic and convert the handwritten text to digital fonts if needed (or mix handwritten and digital notes). All notes can be “decorated” and combined with images or web pages, too. There is a whole array of extra functions, for example auto scroll, different font sizes, line colors, a “predictive engine” autosuggesting words in sentences, a self-learning dictionary, automatic saving of all notes, etc. etc. It’s also possible to pull up the iPad’s or iPhone’s virtual keyboard if needed. The founders of 7notes maker 7knowledge/Metamoji claim they have over 30 years of experience in the language and document processing software business, and it shows. 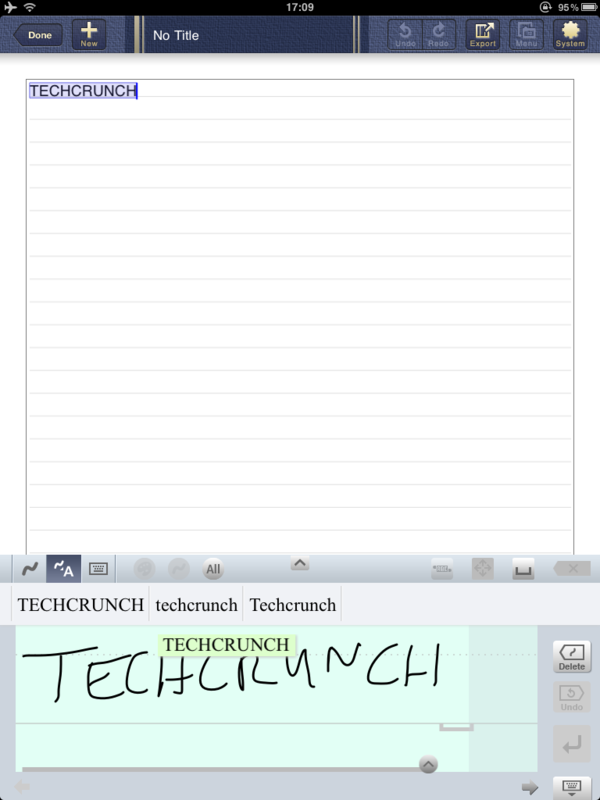 The app’s main selling point is the quality of the handwriting recognition: most of the time (and after practicing for a while), the app was amazingly accurate in identifying the words I was writing with my finger. Users can print and email notes, save them in the iPad’s or iPhone’s photo album, post them to Facebook and Twitter or send them to other applications like Dropbox or Evernote.